... Forestry and Holistic Medicine? Yeah, he’s got the weirdest selection of Skills. He has “Identify Fruits and Plants 98%,” “Tracking” and “Skin/Preserve Animal Hide” at like an 80%, but is specifically said not to know anything about science... except he also has “Forensics,” “Pathology,” and “Holistic Medicine” at 98% or 80%. M&M3e doesn’t have a “Survival” skill anymore, so I improvised with Forestry. I just used "Expertise (Survival)" in it's stead. Same here. Although I often ponder if it should be Wisdom/Awareness based (as per previous editions) or something else. So it seems to this ex-boy scout. Yea expertise Survival is what I used for Erin tarn who has a similar set of skills including Wilderness survival and so on. basically if its in the palladium wilderness skill list its expertise survival. 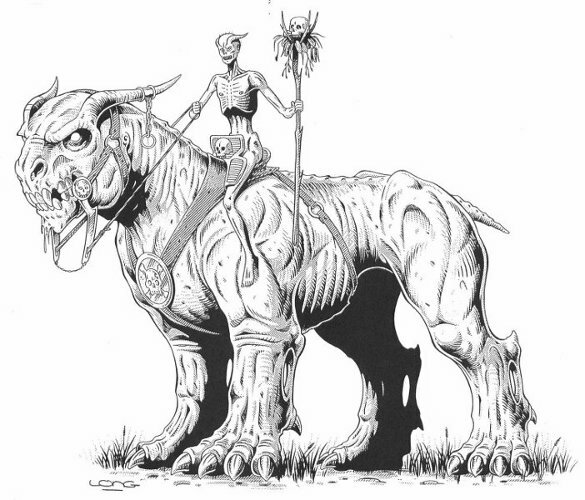 Disability: As demonic steeds, Netherbeasts are essentially mute, able to growl out maybe a single intelligible word or extremely short phrase with difficult and deliberate effort. Growls, terrifying roars, and enraged shrieks are their preferred means of communication. Vulnerability: Magical fire, magic weapons, and weapons made from silver cause extra damage, halve a Netherbeast's Impervious Toughness against them; Weapons made from the Millennium Tree inflict massive damage, a Netherbeast's Toughness is not Impervious against them. 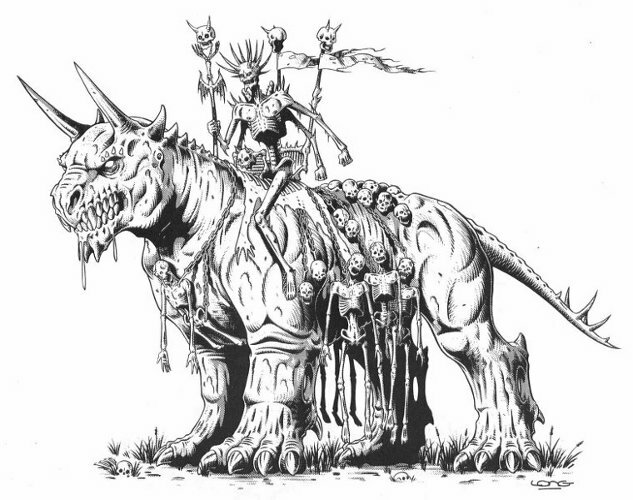 Netherbeasts are used as riding animals by Death, War, and Famine. All three are very similar in size, appearance, and ability and are believed to be indigenous to the dimension where the Apocalypse Demons originate. The giant monstrous animals are powerfully built and resemble a cross between a savage pit-bull and a dinosaur. Netherbeasts have a high animal intelligence and can be quiet cunning. They feed on the flesh, blood, and bones of other creatures, living or dead. Netherbeasts range in color from grey or tan to pale pink and white, with red eyes and ivory colored teeth and horns. Famine's Netherbeast is named Cyno, and appears more emaciated than the others. Cyno has large horns swept to the back of the head. It is white or pale grey in color. This particular beast feeds on rotted food and plants, as well as meat, blood, and bones. Its horns and teeth are grey and decayed looking. War's Netherbeast is named Carnage, it has curled ram's horns, is grey in color, and clad in metallic red body armor. Carnage is said to be the fasted, most powerful, and aggressive of them all. Like its demonic master, Carnage kills for the sheer pleasure of it. It feeds only on freshly killed meat, blood, and bones. Death's Netherbeast is named Bones, which is kind of adorable... But since Netherbeasts cannot talk and Death never speaks (communicating with his mount telepathically) your guess is as good as mine as to how anyone would ever learn its name. Pestilence rides a giant alien beetle, named Raid, rather than a Netherbeast. Raid! That was a great laugh in a book of doom and gloom. 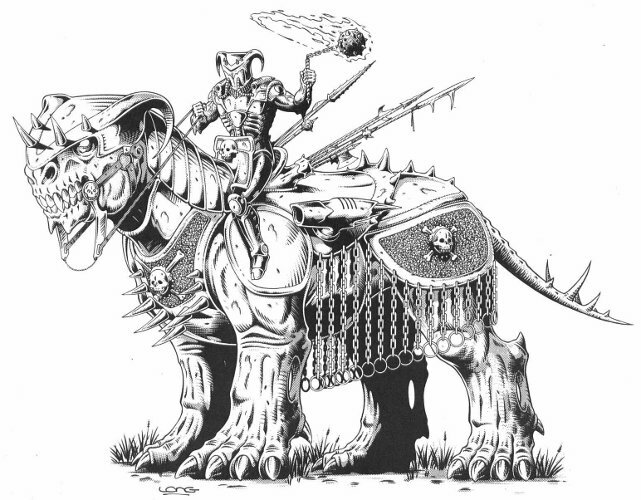 And now were all stuck picturing this giant sentient collection of demonic apocaplypse bugs claling out for his demonic steed. Vulnerability: Magical fire, magic weapons, and weapons made from silver cause extra damage, halve Famine's Impervious Toughness against them; Weapons made from the Millennium Tree inflict massive damage, Famine's Toughness is not Impervious against them. Power Loss (Banishment): A slain Apocalypse demon must recuperate, remaining in their hellish dimension for 1,000 to 6,000 year. Even after that period of time, they cannot return to the place of their defeat (in this case, Earth) for at least 50,000 years. The monster known as Famine looks like a skeleton with a withered, malnourished body, pale complexion, swept back ram's horns, and a malicious expression. He is sinister, cunning, and treacherous, using sneaky tactics to hurt and injure others. He is obsessed with the destruction of all life forms and delights in the suffering and destruction of all life forms and delights in the suffering and destruction inflicted by his hand. Unlike most of the others, Famine frequently strikes quietly from the shadows or at a distance. If he is careful, his control over the weather* and power to spoil food are often mistaken as natural disasters. He also likes to instigate trouble by manipulating others, such as destroying one village's food supply and then somehow letting them know that a neighboring village has plenty, but won't share. These kinds of tactics can lead to theft, vandalism, and war, which means more suffering and death. Famine loves these games. His favorite partner of the other three Horsemen is Pestilence. Their power complement each other perfectly and together they have wrought incredible amounts of starvation, turmoil, and slow death. *I left this set of powers out of his build, they can be covered by his Variable 10. Basically, Famine can make the local weather really nasty in ways that harm crops: droughts, monsoons, hail storms, flash floods, whatever will ruin the local food supply. BG just curious but are you leaving the rune weapons as just clubs? theya re listed as intelligent weapons that can act independently of their owners and have powers all their own. You were using guns that use ammunition. Rookie mistake. ...or be a mutant samurai chicken with a pair of magic swords. Those never run out of ammo. Killer Croc would be proud.